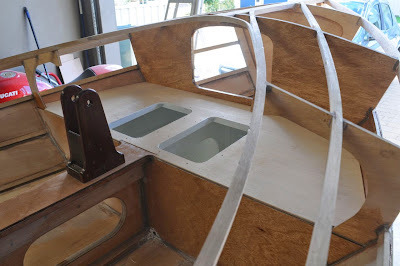 With the second course of planking done, a little bit of thought needs to be put in to what's next, as access to various bits of the boat gets much harder as the planks go on. Before putting the third course in, I finished out the underside of the anchor well and fit the anchor well floor. This has to be done now because, with the king plank in there, the only gap big enough to get the floor in is between the stringers where the third course of planking will go. 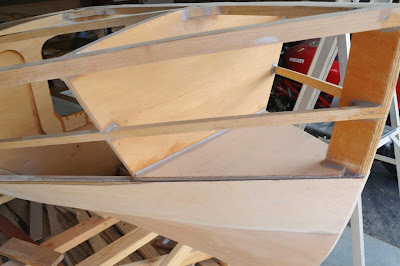 Similarly, once the third course is in, I've really got to do the front thwart, as the top for it only barely fits between the stringers where the fourth (top) row of planking go. Finishing out bits like this provides a useful relief from the monotony of planking, though doing fillets is one of my least favourite jobs. I've got a good recipe for the aquacote epoxy undercoat and polyurethane topcoat now. After getting the fillets to a state where they don't look revolting, I put on an even coat of unthickened epoxy with a foam roller. Then I sand that smooth with 80 grit, and apply two coats of undercoat, again using the foam roller, with a paintbrush for the fiddly bits. The trick with the undercoat is to apply a very thin initial coat, wait about two hours for it to get super tacky, and apply a second slightly heavier coat. That way there are no runs and good coverage. Finally I do three coats of topcoat, again using the brush to get paint into corners, and smoothing everything over with a foam roller. Here's a close up shot showing my battery mount. The plan is to hide an Icom IC-400BB marine radio in here, with the controls on the handpiece remoted back to the cockpit, plus a Vesper marine XB-8000 Wifi AIS transponder so we can see where other shipping is, and they can see us. The 20Ah battery will provide oodles of life. 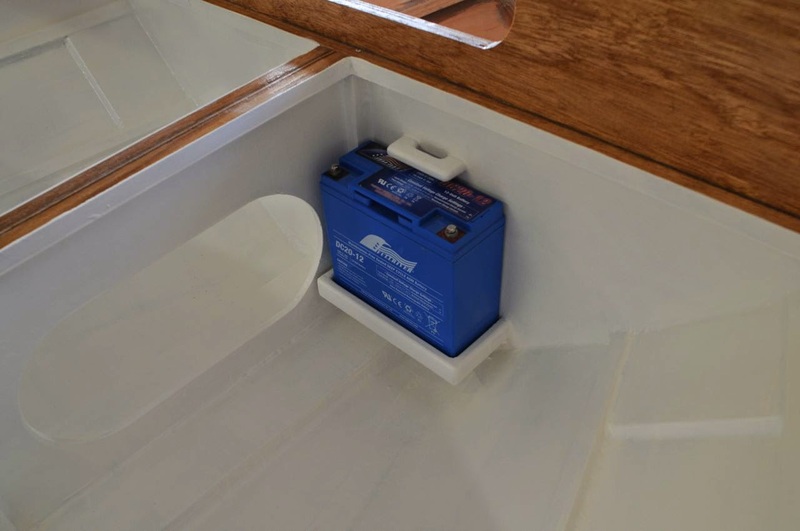 The battery will be secured with a strap and clip, so it'll stay put even if we capsize. Here's a photo showing the lid on the thwart. I've run out of epoxy filler, so am champing at the bit until more supplies arrive, at which point I'll finish this bit off and get back to planking. Finally I took a break from boat building to bake some stuff for a work Christmas party. 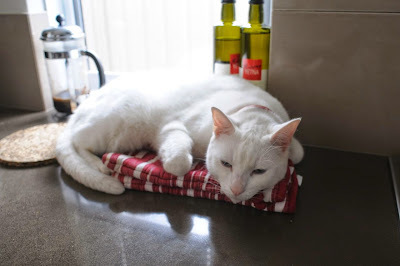 Guess where the cat wanted to sit. One point you might want to think about is installing the bow eye. It is drawn just above the waterline, so it needs to land on the stem below the bottom of the anchor well. If you use blind bolts into epoxy that would work, but if you are trying to through-bolt them, you might want to do so before you completely lose access to the inside. I ended up gluing a pair of carriage bolts into place, and then using nuts on the outside. http://donumvitae.wordpress.com/2010/10/15/bow-eye/. Looking great. I'm jealous of your skills. I find myself fumbling along and generally making a big mess of things. I'm amazed at how clean your build is. How do you get everything all glued up without all the dribs and drabs that I seem to have everywhere? Even when I clean them up, the surface of the wood is 'poxy stained. Anyway...I'm impressed. I finished up the planking over the holidays. Made my sails as well. I began a birds mouth mast, but my first attempt didn't turn out to my liking, so I'm making it again. 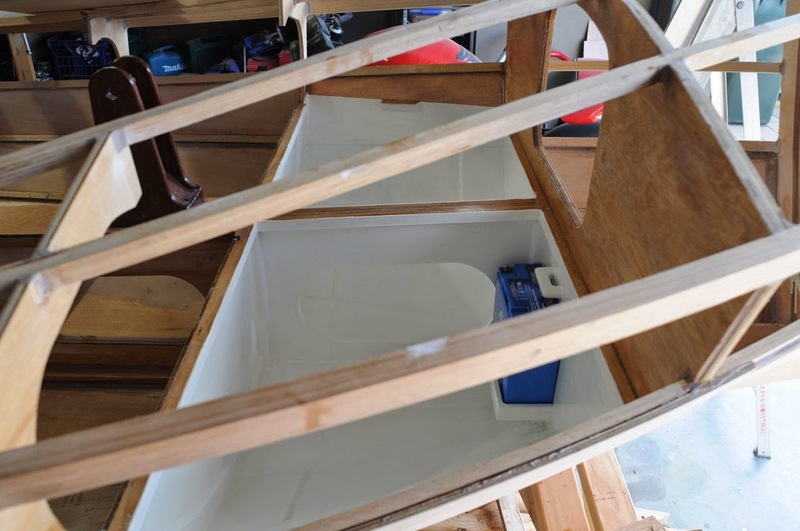 I'm getting to the point of turning the boat over, but I want to clean up the inside and get 'er painted before I do. I'm really dreading the sanding. 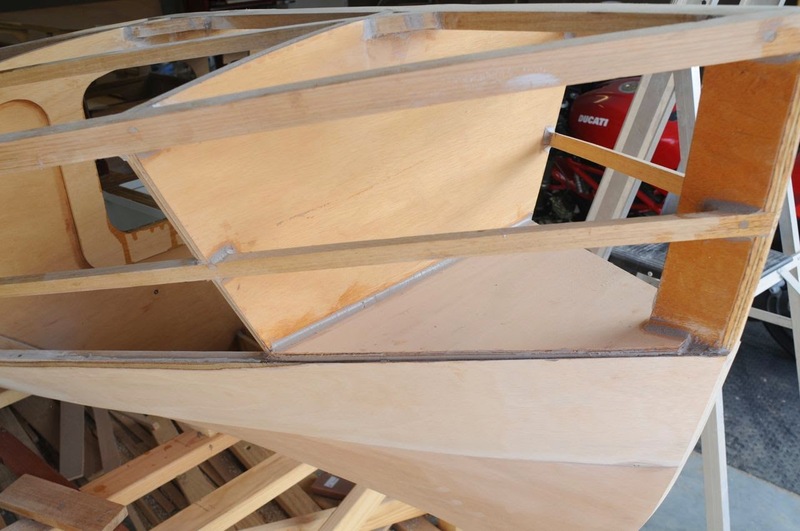 My last boat seemed like I sanded forever. I'll get around to a new post on my build blog one of these days. Hopefully before I have to go back to work next week. Keep up the great work. You're an inspiration. What?? Are you gonna live on your Nav?? Or planning a circumnavigation? AIS?? While I'm on the subject, are you putting an aux electric drive on your boat? If so, what solution have you come up with? It doesn't look at all clean from where I sit. There's goop everywhere. I do my very best to only put the stuff where it's supposed to go, using ice-cream sticks to apply it and tongue depressors to smooth it into fillets. Your boat is looking sensational, and I'm eagerly awaiting more photos. I know the AIS gear is a bit over the top, but I'm a nerd and I can't help myself. In my defence, Geraldton is a pretty barren coastline. If I were to sail up or down the coast from here to the next port it'll likely involve sleeping aboard while on the water. I reckon AIS etc will give me a little bit more comfort knowing that at least I'm broadcasting my position to the bulk carriers that inhabit these waters. I'm still vacillating about auxiliary drive. For now we're going with oars, but in the future I'm envisaging a pair of rudders; one plain and one with a motor in it. That way I can choose whether or not to have the thing on board.